Posted On October 07, 2018 by Team iCynosure. The wedding season has just begun and 'Save The Date' cards have started to arrive. With the number of destination wedding invites this year, I'm beginning to think about getting remarried at a beautiful destination. Of course, I would do a lot of things differently this time around should I end up renewing my vows, first of which would be to find a platform like WedMeGood where I can find genuine and professional wedding vendors available in destination wedding city. The one thing that makes me excited about a destination wedding is a selective close-knit group of invitees, all bundled up in one place for a few days having the time of their lives. Having said that planning a destination wedding is no cake-walk, then there is dire need to find contacts of the vendors, their portfolio and their reviews to find the best out of them. 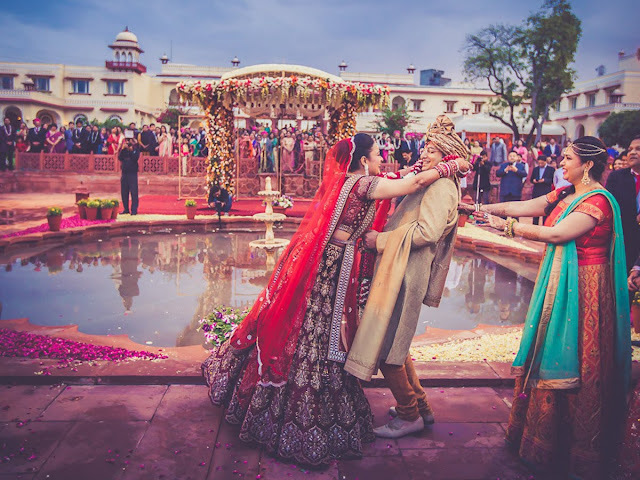 On WedMeGood, you can find best wedding venues in your destination city and once your venue is booked, you can find photographers, makeup artists, mehendi artists and more with a single click. Awesome, isnt it? Download the WedMeGood App today. I will definitely leave all the implementation to the experts but I sure would want to choose the destination in which I’d want to say ‘I Do’. Ever since I’ve started thinking about wedding destinations, I’ve been dreaming of clear skies, crystal waters, land expanse and much more. Here’s taking a look at 5 cities in India that would provide a perfect backdrop for your special day. Goa is by far the most popular places in India for destination weddings with its perfect mix of blue and green. Couples can opt for either casual or exotic weddings, and they will even be spoilt for choice between a beach wedding, a garden wedding, a fort wedding and a church wedding. Anyone who wants to feel like royalty on their wedding day can choose any place in Rajasthan for their wedding. However pegged as the ‘Venice of the East’, Udaipur is the place to consider for a gorgeous palace wedding for its finest cultural and natural beauty to create a romantic landscape for the day. Kerela, known as ‘God’s Own Country’ offers diverse venue options from a beachfront to tea gardens to gorgeous waterfalls. If you are thinking about tying the knot amidst serenity, then look no further than Kumarakom that offers striking views for each ceremony that will remain etched in memories forever. Weddings are all about romance and what better place for romance than Agra with Taj Mahal, the symbol of eternal love. Take your wedding vows in mughali style at the historical place, against the majestic backdrop and enamoured by the culture, to create memories for a lifetime. Hampi is the perfect wedding venue for that offbeat couple who likes being enamoured with heritage and history. Weddings at the famous ruined temple complexes by the shores of River Tungabhadra makes for a unique experience not only fair the couple but also for the guest. So which of these destinations would you choose for your wedding? Or is your mind set on another location altogether? Let me know in the comments below. Planning to say 'I Do' soon? Then don't do it the routine way, head off to an exotic beautiful destination with a bunch of your buds and take your vows amidst people who matter. If I have to renew my woes, I sure would celebrate my day in one of these gorgeous #DestinationWedding locations. What about you?